Living in the Hell's Kitchen neighborhood of New York City, Matt Murdock is blinded by a radioactive substance that falls from an oncoming vehicle. While he no longer can see, the radioactive exposure heightens his remaining senses beyond normal human ability. His father, a boxer named Jack Murdock, supports him as he grows up, though Jack is later killed by gangsters after refusing to throw a fight. After donning a yellow and dark red, and later an all dark red costume, Matt seeks out revenge against his father's killers as the superhero Daredevil, fighting against his many enemies including Bullseye and the Kingpin. 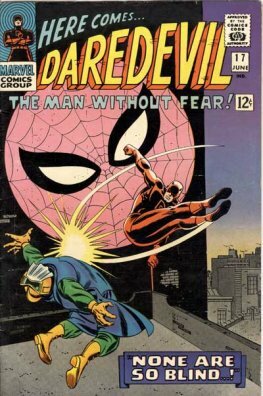 Daredevil's nickname is "the Man Without Fear". 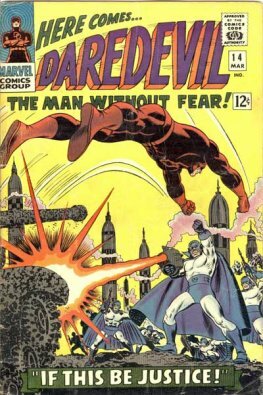 While Daredevil had been home to the work of comic-book artists such as Everett, Kirby, Wally Wood, John Romita, Sr., and Gene Colan, among others, Frank Miller's influential tenure on the title in the early 1980s cemented the character as a popular and influential part of the Marvel Universe. Daredevil has since appeared in many various forms of media including several animated series, video games, merchandise, and the 2003 feature-length film Daredevil, where he was portrayed by Ben Affleck. 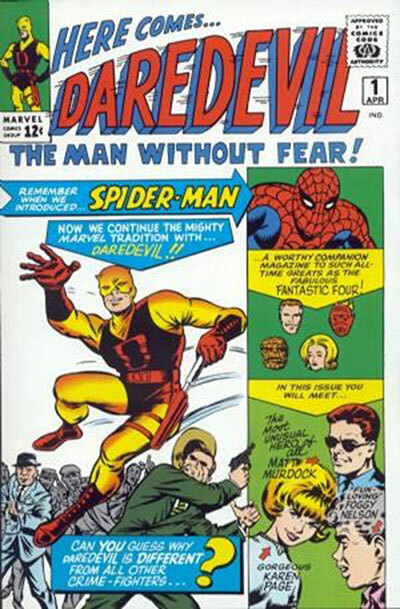 Lee - Ray - Romita - Rosen - Forbush Appearance: Spider-Man "None Are So Blind..!"